When it comes to experimenting with new flavors (and colors) in its repertoire, Doritos is one of the snack aisle's frontrunners. From the "Jacked" series and bags of rainbow-colored nacho cheesy chips, to organic Doritos destined for Whole Foods stores, the brand is constantly churning out crunchy new snacks in quirky and unexpected flavors. Not to stray from that trend, the snack purveyor introduced yet another new flavor this week -- one that'll appeal to fans of both sushi and sinus-clearing spice. 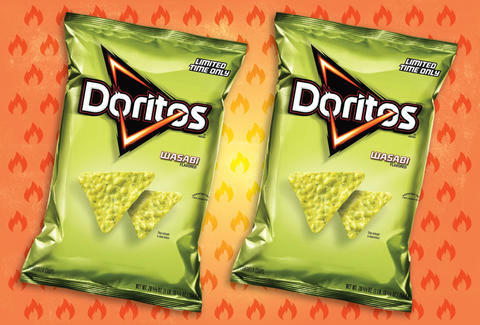 Behold: Wasabi Doritos. Doritos latest foray into the flavorverse is inspired by the super pungent and spicy green Japanese horseradish frequently served alongside sushi rolls. Bags of the new chip variety were recently spotted by the team behind the Instagram account Candyhunting, which located them at Walmart. They're also available at Sam's Club and via Amazon. However, you'll have to act fast if you want a taste because they're only available for a limited time. As for what they taste like, reviews are somewhat mixed, at least judging by the comments on Candyhunting's post. "These are so gross" wrote one user, while another described them as "Just ok not spicy at all." However, Instagram user ms_puertorico_2017 is a huge fan, captioning a photo of the bag she snagged with "THEY ARE BANGING! I only had suggestive serving size 10 chips, NOW SOMEONE HIDE THE BAG!!!" Now that's an endorsement. We've yet to have a taste ourselves here at Thrillist to check out how they stack up, but we'll keep you posted.